Below is our review of the Acer Aspire V3-771, a 17.3" laptop, featuring 6GB RAM, 500GB hard drive and Windows 8. So you're looking for a 17.3" notebook, but have a budget or around £400 - what to buy? 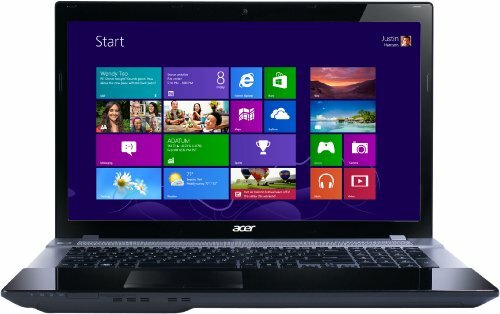 There's an increasing amount of choice out there from a wide range of laptop manufacturers - Acer offer the V3-771 from their Aspire range - famous for offering very good value for money. perhaps a less trendy make than some, Acer typically offer a very high spec for not much outlay. Similar to the rest of the latest Aspire range, the V3-771 offers a shiny gloss black finish - looks impressive but does have that annoying tendency to pick up the odd fingerprint - so you may need to regularly clean the laptop, especially if regularly used by little hands. With this laptop offering a larger screen, subsequently it's dimensions are larger to accommodate this increase in display. As a result, this laptop weighs a touch more, and measures a little extra than it's 15.6" equivalents. Also, as a result of the increase in cost of the extra screen size, the components will be slightly less expensive than a smaller but equally priced laptop - please bear this in mind. obviously the benefits are that you get a much large display, which is ideal if it's your main source of computing - more comfortable to work on, and easier to watch films and play games on. The processor is supplied by Intel - it's the Core i3 3110M 2.4GHz model, and when paired with 6GB of RAM, as well as the inbuilt graphics card, this laptop offers good performance - all of our testers were impressed with the speed, especially considering the low cost of this notebook. Windows 8 is the operating system, which we couldn't fault, and the spacious 500GB hard drive offered a lot of space, and should be more than ample than the majority of users. So who should buy this laptop? Maybe not ideal for commuting with, as a touch too large - but ideal for students, and for those who want a reasonably priced laptop for using at home. Small enough to still be portable, large enough to comfortably be able to type on for extended periods of time. Pros: Decent 17.3" screen, decent spec, runs fast. Cons: A touch large for regular travel - ideal for everything else though. If you're after a larger screen laptop at a bargain price, then the Acer Aspire V3-771 is a definite contender.